Oh My Goodness! I didn't realize how long it has been since I participated in the Fancy Friday Blog Hop. I sure have missed these amazing gals. Truth be told...I have been so incredibly busy that I just haven't had time to stamp as much as I would like, so I decided to make an extra effort to participate in this month's hop. The Fancy Friday team consists of some of the most talented Stampin' Up! demonstrators around...all current or past Artisans. If you are hopping with us, you should have just arrived from visiting the fabulous Dani Dziama. There are several suites in the Annual Catalog that have a tropical vibe, but sadly I don't have any of them. However, I do have some of the gorgeous Tropical Escape 6"x6" DSP (#146916), so I opted to work with that as my focus. I wanted to kick the background up a notch so I added an ombré effect to the DSP by using a sponge brayer to layer on some So Saffron ink. I concentrated most of the color toward the bottom and got lighter as I moved toward the top. It really makes a bold statement and adds a much-needed pop of color. For the sentiment I stamped the greeting from the Stitched All Around stamp set (#146632)in Jet Black StazOn Ink on Whisper White cardstock. I used a frame from the Foliage Frame Framelits (#146353) to die cut the sentiment and then layered it on the gorgeous frame from the Stitched Labels Framelits (#146828) cut from Basic Black cardstock. The flowers are stamped in So Saffron ink using the Falling Flowers stamp set (#139556) and I used the Dark Calypso Coral Blends marker to color some clear rhinestones for the flower centers. Finally, I added some Mint Macaron and Call Me Clover leaves die cut with the Foliage Frame Framelits. This card also works well with the card I made this week for Global Design Project, so if you are looking for more inspiration, be sure to scroll down and check that out as well. I can't wait to see what the other Fancy Friday team members have created. Be sure to hop on over to visit my amazing friend, Sylwia Schreck. Our challenge this month is to take the colors and technique inspired from the Painted Autumn Suite! 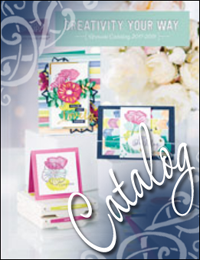 This beautiful suite is found of pages 48-49 of the 2017 Holiday Catalog. However, there is one tiny little problem...I don't have anything from this suite. I meant to get around to placing an order, but before I knew it, it was too late for this hop. So instead, I decided to "be inspired" by this awesome suite of products. After a bit of research, I took some stamps that I already owned and tried my best to capture the feel of the Painted Autumn Designer Series Paper. Naturally, I couldn't do an exact copy, but my goal was to use similar natural elements and colors. To accomplish this I used the Blooms and Wishes stamp set from the 2017-18 Annual Catalog. It is a great set with lots of natural elements. I started by stamping the flower in Daffodil Delight, the flower centers in Cajun Craze (using a pencil eraser), then the branches in Early Espresso, and finally the leaves in Lemon Lime Twist and Peekaboo Peach on a Very Vanilla card base. Next I added hand-drawn accents using Stampin' Write Markers in the same colors. I also used a Tangerine Twist marker to color the berries on the branches and finally I flicked Crush Curry splatters over the entire piece. I distressed the edges of the panel and heavily sponged practically everything on the card with Early Espresso ink. For the sentiment I stamped the beautiful greeting from the Count My Blessings stamp set in Early Espresso ink and die cut it with the Stitched Layers Framelits. I added an Early Espresso scalloped circle die cut with the Circle Layers Framelits. I wrapped a strand of twine from the 5/8" Burlap Ribbon around the card panel and then added a doily and the sentiment on top. One tiny detail that you might miss is that I also used one of the branches from the set and stamped it tone-on-tone around the edges of the Early Espresso card base. The result is very subtle, but I love the look it gives to the finished project. I can't wait to see what the other Fancy Friday team members have created. Be sure to hop on over next to visit my amazing friend, Krista Frattin. It's time for our Fancy Friday Blog Hop. Our Fancy Friday team consists of some of the most talented Stampin' Up! demonstrators around. If you are following our hop, you should have just visited my amazing friend, Jeanna Bohanon. Isn't her project just wonderful. Our challenge this month is to tell about our top 5 product picks from the new Annual Catalog and then create a project using at least one of them. It would have been difficult to use all five items on a project, so for my card I used three. I love that I was able to mix the new with the old for a great project. I started by embossing a piece of Calypso Coral cardstock with the new Garden Trellis embossing folder. Then I gently dragged a Whisper White Craft Ink Pad across the embossing to accentuate the pattern. Next, I stamped the image from the Floral Phrases stamp set. I used Stampin' Write Markers to color the images before stamping on Whisper White cardstock. I used one of the "almost" new Stitched Framelits Dies to die cut a circle. Then I also die cut the word "friend" from Basic Black cardstock using the new Lovely Words Thinlits Dies. I love the versatility of these dies. To finish off the card, I die cut Old Olive and Always Artichoke cardstock using the leaves from the May Flowers Framelits dies. I used sponge daubers to color the edges of the leaves with the same color of ink and then I shaped the leaves using the round end of an AquaPainter on a Stampin' Pierce Mat. I can't wait to see what the other Fancy Friday team members have created. Be sure to hop on over to visit my amazing friend, Susan Wong.